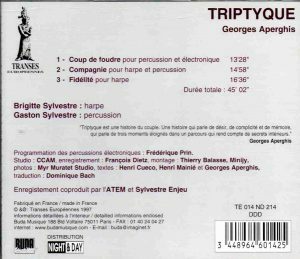 A Triptych written by Greek-French composer and pioneer of music theatre, Georges Aperghis, for husband percussionist and wife harpist Gaston and Brigitte Sylvestre. Liner notes don’t say, but Aperghis’ website does: it was composed in 1982. Supposed to depict “the story of a couple”. Part one, “Coup de foudre” (Love at first sight), is scored for percussion and electronics, “Compagnie” for harp and percussion, and “Fidélité” for harp, the latter supposed to depict the memory of the previous mo(ve)ment. TT 45 minutes. What you hear is Aperghis’ usual theatre in music. In “Coup de Foudre”, lots of noises of percussion, voice itself used as a percussion instrument with text reduced to single words and even syllables – there’s a long explanation in the liner notes about what it might mean, but what’s music that requires long explanations to “get it”? With the way Aperghis uses – and destructures – his text, the “meaning” doesn’t really matter, I think it’s best taken as an added percussion. The “electronics” here seem reduced to tape running simultaneously with more percussive text and percussion from Gaston, and a few interjections from Brigitte and harp. I find “Companie” more interesting, because, while Aperghis’ scoring for percussion doesn’t really bring any new discovery, the sounds he elicits from the harp, and the dialogue with percussion (here used more for color and timbre than percussive noise) sound to me more original. The last part of the trypitch is also more typically Aperghis, in its combination of performer playing the instrument and uttering shards of phrases – and at times even complete and intelligible phrases (texts and translations not provided in the booklet, only the short presentation of the piece by Aperghis gets an English translation). 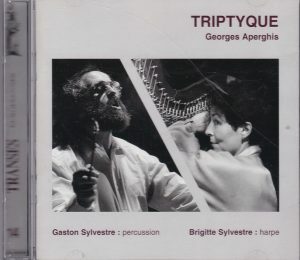 Triptych’s limitation, even for the fan of Aperghis, is that, when you know his music well, it’s all very predictable: your usual Aperghis. This CD is fine as a complement to your Aperghis collection if you are a fan of the composer (I am), but it’s not the CD to start a discovery of this very orignal musician. Go to Récitations for Solo Voice or Sextuor – L’Origine Des Espèces. And see all my other reviews of works of Aperghis, and the CDs of his that I have but haven’t had time yet to hear and review.